The Klipper Stream will carry New Zealand’s first load of Zespri Kiwifruit from the Port of Tauranga to China for the year, marking the start of what looks like another record-breaking season. Loading began Thursday morning and the ship is scheduled to pass through the harbour entrance on Good Friday. This year’s New Zealand-grown crop is expected to be about 20 million trays – 70,000 tonnes – higher than last year. 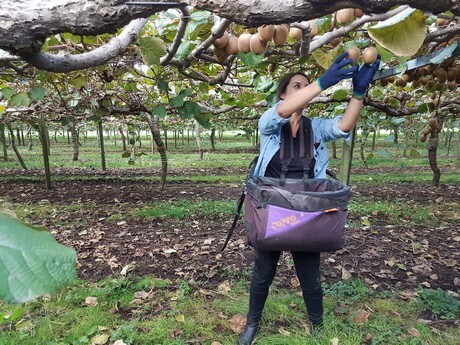 New Zealand Kiwifruit Growers Inc. CEO Nikki Johnson says, “Kiwifruit is New Zealand’s largest horticultural export and this season is projected to be no different. New Zealand growers can be proud to say they produce a world-leading fruit superior in quality and taste which will be marketed to over 50 countries”. Zespri Chief Executive Dan Mathieson says both the company’s two biggest markets, Japan and China, are forecast to grow strongly. Zespri is also looking for solid growth across the rest of Asia as well as Europe and North America, where supply did not meet demand last year. “Demand for safe, healthy fruit continues to grow exponentially in China, in terms of both volume and value. However, our Japanese market is going great guns as well – we’ve seen a 30 percent sales growth there over the past four years. By 2025, Zespri expects international kiwifruit sales will hit at least $4.5 billion. In the next 12 years, that growth is expected to bring more than 29,000 new kiwifruit jobs to regions around the country, according to a recent University of Waikato report. The report also predicted that the kiwifruit industry will triple GDP contribution to over $6 billion to the economy by 2030.